Adorn your home with transitional style with this accommodating leaning bookcase. This storage piece features six shelves for getting organized or simply decorative purposes. Pair with the computer credenza to complete the look for your home office. The Stone Brook Leaning Bookcase with 6-Shelves by Liberty Furniture at Furniture Discount Warehouse TM in the Crystal Lake, Cary, Algonquin area. Product availability may vary. Contact us for the most current availability on this product. Drawer / Shelf Construction All wood dovetail drawer construction; dust proofing; screwed flush mounted back panels. 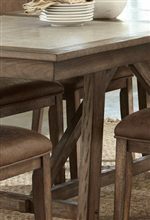 Create a dining room that you and your family are sure to love with the Stone Brook collection. Featuring a trestle table and kitchen island table you will be able to put together a room to perfectly meet your needs. 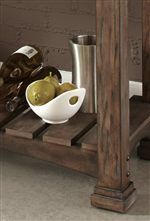 Crafted from poplar solids and white oak veneers in a rustic saddle finish you will infuse your home with a trendy primitive style. The Stone Brook collection is a great option if you are looking for Transitional furniture in the Crystal Lake, Cary, Algonquin area. 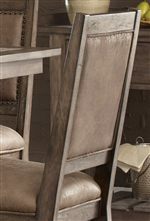 Browse other items in the Stone Brook collection from Furniture Discount Warehouse TM in the Crystal Lake, Cary, Algonquin area.